Too fast, too fast! Another week down! A 5 day week, followed by a 3 day week - I am going to be happy, happy, happy next weekend! It's time for another Math Game Monday. This week's game requires only dice and a workbook or whiteboard. You could play this game towards the end of Kindergarten (just use smaller dice) or even in 3rd Grade. Read and see how you can differentiate this activity, simply by changing the dice and number of dice. 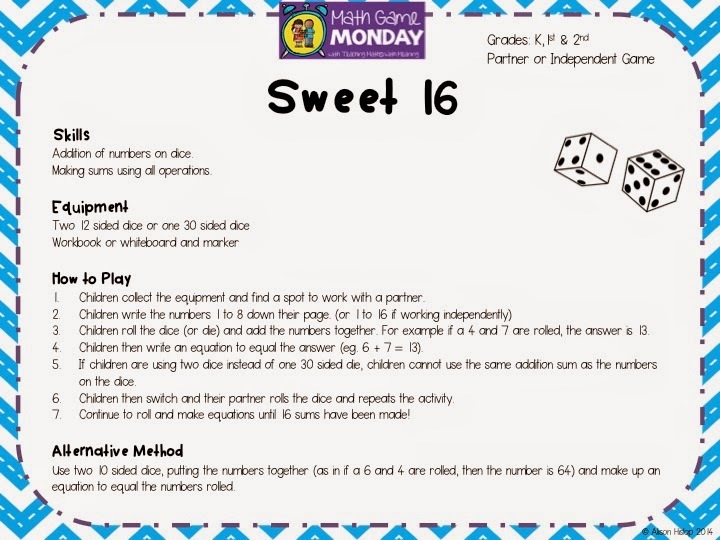 Click here if you want to find previous Math Game Mondays activities. I love that by changing the dice you can completely differentiate this game! Definitely! Thanks for the comment Tara! I love and look forward to your math games each week, Alison! Thanks! Thanks Lisa! I am glad you love them!